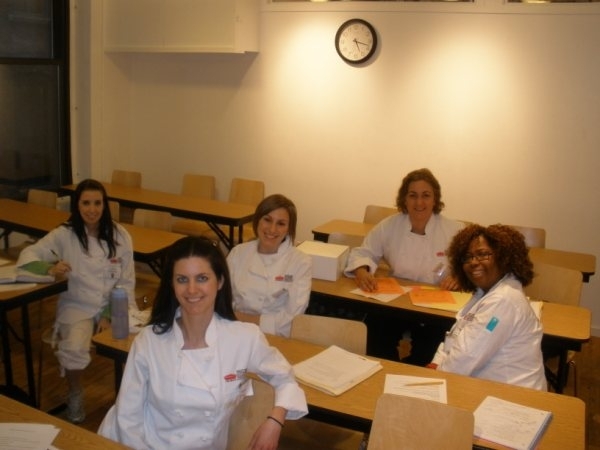 Nicole Croes is a member of Chef’s Training Program class 178, which began several months ago. As CTP 178 approaches the end of their program, they are in the process of planning their 3-course Friday Night Dinner for 100 guests – the final project for every graduating class. Nicole will be blogging the entire Friday Night Dinner process in installments here on Blanched and Shocked. Here is Part II . . . If you’re not an NGI student, you may not realize the significance of the Friday Night Dinner process. Foremost, it means you’ve entered into your figurative “Junior Year” of school. You’ve sautéed, steamed, broiled and baked. You’ve julienned, brunoised and concasséd and know what all that means. You can prepare an apple galette in your sleep, and the thought of a poached pear test will probably haunt you for the rest of your life. So Friday Night Dinner planning is a rite of passage. After so much hard work and dedication, after shedding your blood, sweat and tears (quite literally), it’s the moment you finally start to feel like a chef. You’re ready to plan your own meal and feed your public. Our class divided into two separate dinner groups – Groups A and B, each unified in a common goal: to plan the perfect Friday Night Dinner. I guessed this is what it would feel like on an episode of Dinner: Impossible. The task seems daunting and unimaginable, but in your heart you know somehow it’ll all work out beautifully. You know this mainly because it’s worked out for every class that’s gone before you and because each class has a Tim Gunn-like chef (for us that’s Chef Elliot) helping to “Make it Work.” So, I have faith that no matter what ensues between now and July 9th, we’ll create a delectable and memorable meal. The possibilities for a three-course vegan dinner are endless. There’s every cuisine from Mexican to Moroccan, a wealth of seasonal ingredients at your disposal, and an array of ways to prepare them. As fun as it is to think about, it can also be very overwhelming. So to get started, our group met over a few Saturday lunches to organize our ideas, bounce around new thoughts, and share opinions. By our first official meeting with Chef Elliot, we were to have settled on our entrée. Step one was a breeze. We made a surprisingly fast decision on a Mediterranean menu, since most of our group had some sort of Mediterranean background or, at least, knowledge of Mediterranean cuisine. Step two, deciding on a Mediterranean entrée was not as simple. We pulled out every Greek, Turkish, Spanish, Italian, North African cookbook we could find, and wrote down every promising creation we could think up: Greek manicotti, moussaka, lentil and rice-stuffed vegetables, bean burgers, and the list went on . . . Finally, after much deliberation, thought and many email exchanges, we settled on a trio of meze for our first course, an “Opa” croquette for the main course, and a medley of ice creams presented in a handmade pizzelle for dessert. I have to say, I was rather pleased that we not only tackled the entrée assignment, but we pretty much had the entire menu planned. I knew there would be some tweaking to do, but I was ecstatic that we were well ahead of the game… or so I thought. Hands folded, wide-eyed, we sat in the Lecture Room with Chef Elliot while he read over our menu. As he did, I couldn’t help but think about that scene in A Christmas Story when Ralphie turns in his theme paper on the Red Rider BB Gun he wanted for Christmas and conjures up visions of his classmates hoisting him on their shoulders, while his teacher scrawled “A++++” all over the room. For a fleeting moment I pictured our very own “A++++” moment, certain our thorough menu would be a hit. That didn’t happen. Though I wasn’t entirely shocked that Chef didn’t prance around the room, drawing plus marks on the chalkboard, I certainly didn’t expect what was to come either. Chef Elliot’s expression was sort of confused and then amused. After an awkward minute or two, he finally said what we’d hoped to hear: he was impressed. But then he went on to explain that “confused” look. Chef told us that while he appreciated our hard work and liked our menu, the other group had presented a remarkably similar menu to him at their meeting. What are the odds? Well, in our class, they’re pretty great. Our class is close – very close. We eat together, hang out together, study together, brunch together and, well, basically do more together than most married couples. So the fact that our ideas were practically carbon copies of each other was actually rather fitting. On the downside, our group was back to square one. We collectively decided that it would be best to change our menu so the school didn’t have two Mediterranean Friday Night Dinners in a row. That meant we had to come up with whole new idea and we had to come up with it fast. Somehow, through the Great Friday Night Dinner Brainstorm of 2010, a brand new, fresh (or shall I say French) menu was born – in record-time. We may not have all the I’s dotted and T’s crossed yet, but we’ve come a long way. One obstacle down and on to recipe testing we go! This all sounds so exciting! I can’t wait to check out a Friday Night Dinner sometime soon. Good luck chefs!!! Friday Night Dinners are hard work (we had five courses back in 2000-01), exhausting, but oh so satisfying. I have fond memories of our little class working like elves, assembly-line style, putting all the dishes together. It was a lot of fun. Good luck! Sounds like you are off to a good start with your French menu…good luck!!! I love reading your blogs!